Department of Dermatology, Indira Gandhi Medical College & Research Institute, Puducherry, India. Acathosis nigricans (AN) typically presents as symmetric, brownish-black, velvety, hypertrophic, verrucous, and at times papillomatous plaques most commonly involving the flexural sites . It is a cutaneous marker, most frequently of insulin resistance and less frequently of malignancy . AN has been classified into 8 types: benign, obesity-related, syndromic, malignant, unilateral, acral, drug-induced, and mixed AN which is a combination of one or more of the above . Nevoid AN is a variant characterized by unilateral distribution of morphologically and histopathologically diagnosable AN without any other accompaniment of common AN. We report a case of nevoid AN which was linearly distributed in the leg. A 40-year-old female patient presented with asymptomatic, linear, raised, pigmented and velvety lesion on the anterior aspect of right leg since 15 years of age. The lesions grew for some years initially, then remained constant without any regression. She did not have any other systemic complaints, nor was she on any medication. On examination, a linear, brownish to hyperpigmented, velvety hyperkeratotic plaque was seen on the anterior aspect of the right leg (Fig 1). Fig 1: Linear plaque on right leg. There was no hyperkeratotic lesion in the other areas. She was not a diabetic or obese. Systemic examination did not reveal any abnormality. A skin biopsy was performed which revealed hyperkeratosis, papillomatosis and mild irregular acanthosis. Dermal papillae showed upward fingerlike projections, the valleys between the papillae showed mild to moderate acanthosis and the epidermis at the tips of the papillae and on the sides of the protruding papillae appeared thinned (Fig 2). There was normal melanin distribution in the basal layer. A diagnosis of linear acanthosis nigricans was made. 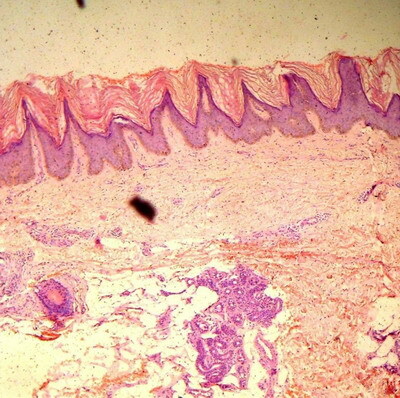 Fig 2: Histopathology showing hyperkeratosis, paillomatosis, mild irregular acanthosis, fingerlike projections of dermal papillae, and basal layer melanin (H&E, X 100). Nevoid acanthosis nigricans is a rarely described benign disorder of keratinization with histopathologic findings similar to the common form of AN, i.e. 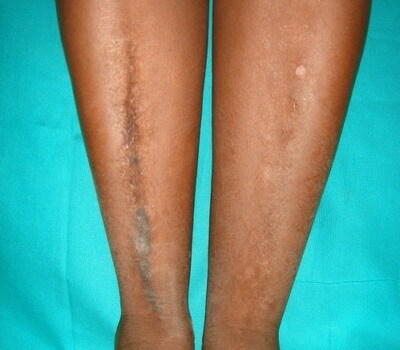 hyperkeratosis, papillomatosis and moderate acanthosis. It was first reported as an epidermal nevus resembling AN by Curth in 1976 . Nevoid AN may be localized as a solitary lesion or occur along the line of Blaschko . It can occur as an autosomal dominant trait in some patients and may manifest at birth or before or during puberty and remain stationary after an initial phase of growth . It is not associated with systemic, endocrine or syndromic conditions and has an unpredictable outcome with persistence or spontaneous regression [4,6]. AN is thought to be derived from keratinocyte and fibroblast proliferation in response to circulating growth factors. Nevoid AN may derive from mosaic expression of constitutively activated growth factor receptors in keratinocytes, leading to their proliferation . Nevoid AN can closely resemble an AN form of epidermal nevus (EN) as exemplified by reports of either entities in the literature . AN lesions usually have a more velvety consistency than epidermal nevus and they histopathologically show mild hyperkeratosis, papillomatosis and limited hyperplasia (like in our case) . In contrast, the histology of EN is more variable, often with prominent corrugated epithelial hyperplasia . However, Submoke and Piamphongsant  described typical histopathologic features of verrucous EN and AN in different sections of a skin biopsy of one patient. Various locations have been reported, including the face and scalp, chest and abdomen, and especially the periumbilical area, submammary region, back and thigh. Unlike the classical symmetrical AN that normally involves the flexural areas, nevoid AN does not have a predilection for intertrigenous areas. A majority of the cases reported in the literature had their origin from the midline with unilateral distribution . This case is being reported for its rarity. 1. Sinha S, Schwartz RA. Juvenile acanthosis nigricans. J Am Acad Dermatol 2007;57:502-8. 2. Ersoy-Evans S, Sahin S, Mancini AJ, Paller AS, Guitart J. The acanthosis nigricans form of epidermal nevus. J Am Acad Dermatol 2006;55:696-8. 3. Curth HO. Unilateral epidermal naevus resembling acanthosis nigricans. Br J Dermatol. 1976 Oct;95(4):433-6. 4. Jeong JS, Lee JY, Yoon TY. Unilateral nevoid acanthosis nigricans with a submammary location. Ann Dermatol 2011;23:95-7. 5. Das JK, Sengupta S, Gangopadhyay A. Nevoid acanthosis nigricans. Indian J Dermatol Venereol Leprol 2008;74:279-80. 6. Krishnaram AS. Unilateral nevoid acanthosis nigricans and neurofibromatosis1: An unusual association. Indian J Dermatol Venereol Leprol 2010;76:715-7. 7. Colegio OR, McNiff JM, Antaya RJ. Nevoid acanthosis nigricans with subtle melanocyte hyperplasia. J Am Acad Dermatol 2008;58:S102-3. 8. Submoke S, Piamphongsant T. Clinico-histopathological study of epidermal naevi. Australas J Dermatol. 1983 Dec;24(3):130-6.